Wimbledon is one of the most prestigious competitions in all of sports, the tournament was being played throughout this week, and it has come to its exciting conclusion. Wimbledon is one of the four Grand Slam tournaments of professional tennis, and the oldest of the group. During this tournament hundreds of men and women compete for the chance to bring home the title, but this year’s tournament ended with some familiar faces on the championship side. Serena Williams and Novak Djokovic managed to raise the trophies in their respective singles divisions after defeating formidable opponents in the finals and throughout the tournament. Wimbledon was full of excitement, as fan favorites played strong games and several new faces burst their way into the world of tennis by taking sets from the game’s best. There were several amazing moments in this tournament, from the unforgettable matchup of the Williams sisters, to the tenacious play of hometown favorite, Andy Murray, in his losing effort, but there were two moments that caught my eye and have ranked as the best of the tourney. The first of my favorite moments was when Serena Williams won the final set of the championship match, she was so shocked at how quickly it ended that it seemed like the victory didn’t actually register until about five minutes later. The other moment of the tournament that really stuck with me was the men’s championship match, while Djokovic won this match, it seemed like Federer was making every single point a battle. This tournament was extremely entertaining from start to finish. Tennis may not be the most popular sport in America, but with the stellar play that went on at Wimbledon, I’m sure the upcoming U.S. Open will surely bring in a large crowd of new fans. Day 188: World Cup Champions! I am about a day late on this, but I have to congratulate the U.S. Women’s National Team for their World Cup victory. The U.S. team managed to dismantle Japan in the finals, as they coasted to a 5 – 2 victory behind the power of an early hat trick by Carli Lloyd. The final game was surprisingly watchable, considering how ugly it was early on, the U.S. Team managed to score four goals in about 15 minutes. The scoring in this game happened so quickly that I didn’t even have time to turn on a television before the U.S. was up 3 – 0. I have to commend Japan for staying in the game and keeping it competitive even though they were down by four, there were even times in the game that I thought I would see a comeback, but the U.S. wisely held their lines and kept to the game plan. 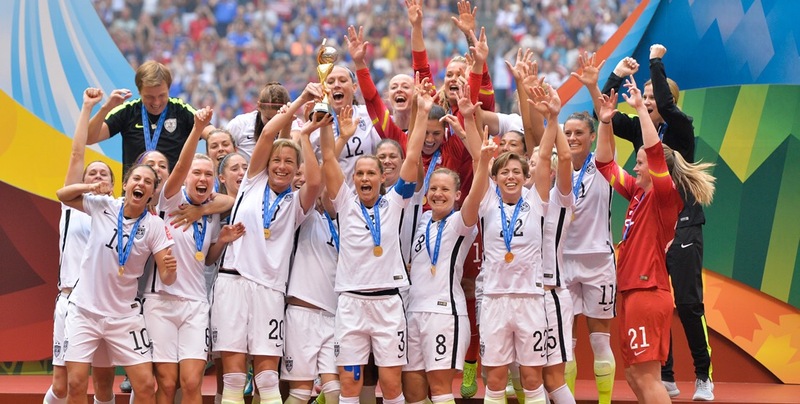 The major story of this year’s Women’s World Cup was gender equality. The women who played in this tournament not only played as hard as the men, but they also put on just as good of a show. I watched quite a few games if this tournament and I can honestly say that soccer is a sport in which the intensity of the women’s game often surpasses that of the men. FIFA needs to take a close look at what went on this summer in Canada, and they need to start paying the women better and treating the athletes with more respect. I know that women’s sports in general does not get the level of coverage of the male variation, but I believe that this World Cup, and the way all of the qualifying teams played, has done a great job in showing just how competitive and exciting women’s sports can be. The NBA season has come to an end, and it was quite an exciting finish. The Warriors defeated the Cavaliers in a matchup for the ages, and as I predicted they managed to do it in only six games. I was thrilled by the play of both teams but what really caught my eye was the play of Lebron James. He showed that he is worthy of the title of best player in the NBA, but unfortunately he had to face off against the best team in the NBA. The Warriors won against all odds, as their staring lineup was absent of a tall center piece, and they managed to play their brand of basketball without worrying about what the analyst considered to be the most important aspect. I have said plenty of times, even within this blog, that I am not a big fan of basketball, but I think I may finally waver on that stance after watching this exciting series. Every moment of the every game during this NBA finals was exciting, I found myself glued to the screen as I watched the world’s best players on the leagues biggest stage. While the Cavaliers lost, they have much to look forward to next season, the team is young, talented, and hopefully still the home to Lebron James. If the Cavs can stay healthy and learn to play better as a squad, they will be championship contenders next year. The Warriors, a team full of young stars, managed to win this title, and based on their skills and fluidity they may become the NBA’s next dynasty. I am excited for the future of the NBA and I hope to see more teams emerge as championship competitors in the coming years. The NBA finals starts tonight, in this evening’s game the Warriors will face off against the Cavaliers as they start a seven game series. Both teams are extremely talented but this game is highlighted by the presence of the league MVP, Stephen Curry, and the league’s former MVP and best player, Lebron James. The Cavaliers have been running on all cylinders this season, as the return of Lebron James has made this once terrible team a solid championship contender. Lebron is a unique basketball player, he is much faster and more athletic than players his size, and he has a basketball IQ that rivals the greatest players who ever graced the court. It would be hard for any team to face such a daunting task as neutralizing Lebron James, but I honestly think the Warriors have exactly what it takes to succeed. The Golden State Warriors are a team on a mission to disprove the doubters, they were the best team in the NBA this year, and they have the MVP, as well as one of the runner ups for the defensive player of the year award on their team, but they are still not recognized as the favorite to win. In each series the Warriors have played during the playoffs, television analysts gave reasons why they wouldn’t win. The Warriors are a team of shooters, they tend to play outside of the paint, and they don’t have a dominant big man, they basically lack what a “championship caliber” teams has, but they are primed to break the mold. Stephen Curry is a fantastic player, his skill set is not exactly unique, but the aptitude he has for the game makes him one of the best players I’ve ever seen. Curry has the ability to dribble the ball out of tight coverage, and shoot from anywhere on the court, unless the Cavaliers make Lebron guard Curry all game, they will have an difficult time winning this series. These games are going to be competitive, and both teams will be sure to play their hardest in order to take home the trophy, but I have to choose the Warriors to win in seven games. The Warriors have shown they are tough, and they play team basketball, every player on the team knows his place and they have been successful for it, I expect that this team solidarity will be the X-factor in the series and the Warriors will find a way to win a tough last game by a small margin. The teams are set and the starting whistle is about to be blown, I look forward to an exciting end to the NBA season and I hope to see the Warriors come out on top.